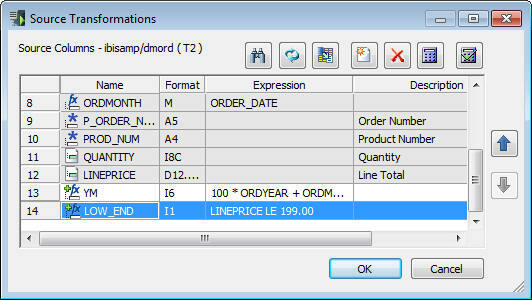 You can create a source transformation in a data source to add intermediate calculations to the request. Source transformations are performed on a data source object as the records are read, before any filtering or aggregation is performed. This is often useful for complex calculations that are composed of multiple expressions. Creating a source transformation is also helpful in performing data type conversions when multiple steps are required, and if you want to aggregate or filter a calculated column. Source transformations are only performed for a particular data flow. A source transformation can contain an expression or a constant. If the source transformation contains an expression, you can create the expression with the Transforms Calculator. You can also enter a value or expression in the expression area. The format is automatically determined and displayed. If you are adding a source transformation to a hierarchical file (for example, FOCUS/FDS), the WITH attribute may be required. The WITH attribute may also be required if you add a source transformation that references a constant. Use of some source transformations disables Automatic Passthru. For more information, see Using Automatic Passthru. You can create a virtual column that appears whenever a data source is used, by adding it to the data source itself via the navigation pane. For more information, see Adding Virtual Columns (DEFINE) in a Synonym. When re-using a synonym in a data flow, such as for a recursive join, the transformations must be the same in all instances of the synonym in the flow. If different transformations are required in each instance, you should create multiple synonyms with different synonym names for these sources and use them in the data flow. In addition to source transformations, you can use the Relational Expression tab of the Transformation Calculator to create a relational expression transformation that can be used in a filter. From the data flow workspace, double-click a data source object, or right-click it and select Source Transformations. The Source Transformations window displays all of the columns in the data source. Note: The columns of the synonym are shaded because they cannot be edited here. Only source transformations can be edited in this window. Type a name and format for the virtual column. Note: If you do not supply a format, the DMC will automatically provide the format based on the expression. Similarly, if you supply the wrong format, the DMC will replace it with the correct format using a pop-up notification to advise you of the change. Use the Columns/Variables and Functions tabs, and the calculator buttons, to build the expression for the virtual column. For information about using functions, see Using Functions. For information about using variables, see Using Variables in a Flow. The new column appears in the Columns list. To verify that the transformation is working properly, click the Test Transforms button. 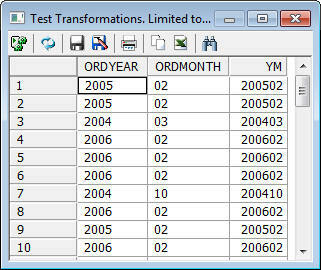 The Test Transformations window opens, showing the result of the source transformation. Click OK to close the Source Transformations window. 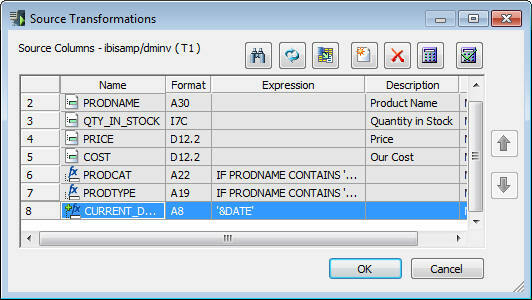 Type a name and type or select a format for the virtual column. Double-click the variable you want assigned to the column from the Columns/Variables tab. You can also type in the variable, which must be enclosed in single quotation marks (‘), as shown in the following image. 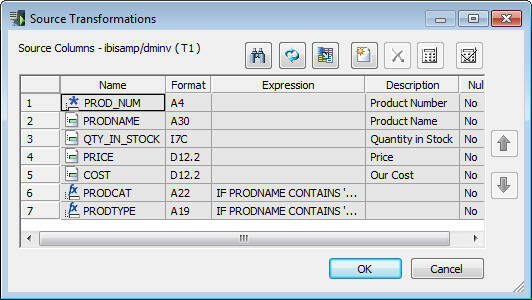 The variable appears in the Expression column in the Source Transformations window, as shown in the following image. The Relational Expression tab of the Transformation Calculator allows you to build an expression that can be used as a filter. Click the Relational Expression tab. Type in a name for the column. Note: Since the transformation will always evaluate to either 1 (true) or 0 (false), the format will be automatically set to I1. Optionally, type in a Title for the column. Click the Add New Row button above the Expression field. A blank line is added to the Expression field, as shown in the following image. Select a Column from the drop-down menu. Select a Relation from the drop-down menu. Select a Type from the drop-down menu. Note: This field is not available if the Relation is set to IS MISSING or IS-NOT MISSING. If the Relation is set to DB_FILE or NOT DB_FILE, Type must be a value. Type in a value or click the ellipsis (...) to select an available value. 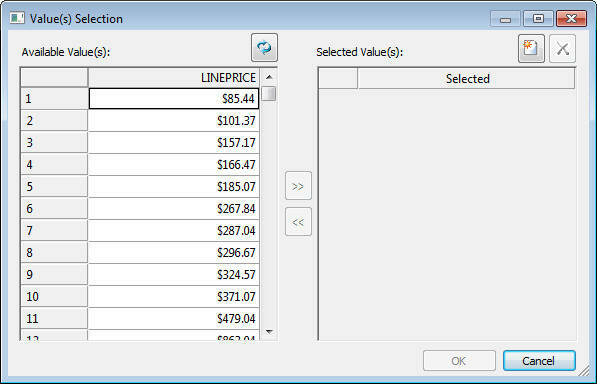 The Value(s) Selection dialog box opens, as shown in the following image. Select one (or more) Available Values and move it to the Selected Value(s) pane using the arrow. Click OK. The Transformer Calculator should look like the image below. Click OK to close the Transformation Calculator. The relational expression appears as a column in the Source Transformations window, as shown in the following image. Note: Using a source transformation column in a filter or as a selected column may disable automatic passthru, so it should be used with care. To access the Source Transformations window from the data flow workspace, double-click a source, or right-click a source and select Source Transformations. Lists the columns in the data source. The first section contains the column order. Note: The symbol for columns in the synonym is gray, while the background for a source transformation (virtual column in the flow) is white. 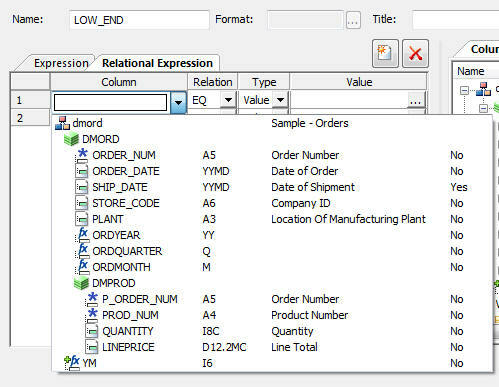 Is the name of the column, and also shows a symbol that indicates regular columns, key columns, index columns, and virtual columns. Refreshes the columns in the data source. Shows a sample of the data from the data source. Opens the Transformation Calculator to create a transformation. Opens the Transformation Calculator to edit a transformation. Moves the selected transformation up or down within the Source Transformations list. To access the column header context menu, right-click any column header. Pastes transformations from memory into the transformation list. To access the source transformations context menu, right-click any column of a transformation. Opens the transformation calculator for the selected transformation. This is the default action. Tests all of the transformations. This can also be done by clicking the Test Transforms button. This option is only available if the selected transformation contains an error, which is displayed in red text. Selecting this option opens a window with the error code and a short explanation of the error. Copies the selected transformations to memory, so that they can be pasted into this, or another, flow. Note: Copying and pasting transforms does not use the Windows clipboard. 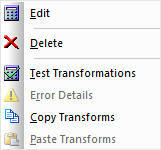 To access the Transformation Calculator, click the Insert button in the Transformations window. Note: If you do not supply a format, the DMC will automatically provide the format based on the expression. Similarly, if you supply the wrong format, the DMC will replace it with the correct format using a notification to advise you of the change. Displays the Relational Expression Builder window. Displays a list of functions that are available for your transformations. Returns the value TRUE if the value on the left is less than, or equal to the value on the right. Returns the value TRUE if the value on the left is greater than, or equal to the value on the right. Inserts two single quotation marks. Enter alphanumeric test values between these.